The 34-year-old Chicago native also helped first lady Michelle Obama develop her garden. Assistant White House Chef Sam Kass holds a sweet potatoes as he works with first lady Michelle Obama as she participates in the White House Kitchen Garden Fall Harvest with students on the South Lawn of the White House in Washington, Wednesday, Oct. 20, 2010. Kass is hanging up his apron after serving the first family for six years. 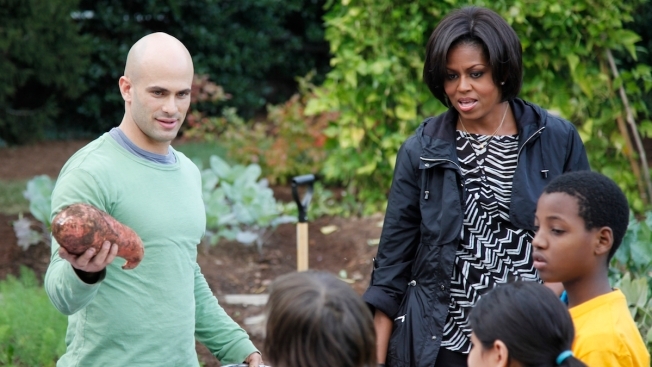 Sam Kass cooked up policy as well as meals for President Barack Obama and his family for six years. He was not only their personal chef but also their senior adviser for nutrition policy, something new for a White House chef. The title gave him a seat at the table where administration officials hashed out everything from updated food labels to new requirements for healthier school lunches. But Kass is also a newlywed. And he's leaving the White House at the end of the month to join his wife in New York City. The plot led to her signature anti-childhood obesity campaign, which Kass eventually came to oversee as executive director — his third White House title.